One of my most popular posts ever is actually not about apply my mind to Christianity or politics or philosophy...but to Madden NFL video games. Oh well, I'm not complaining about readers, so let's update it for Madden 17! Instead of spending 5 scouting points for the first attribute, now you have to spend 15. That makes initial inquiries eat up your scouting points REALLY fast. 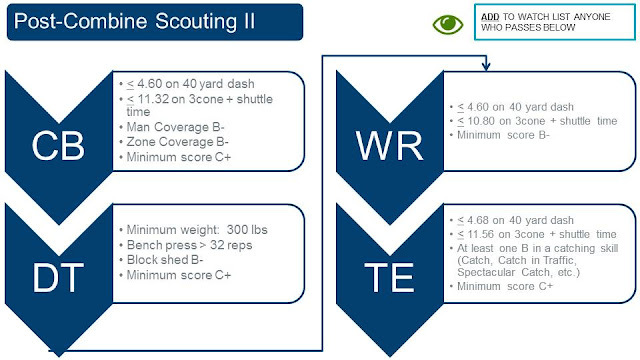 The Combine is no longer exact: the combine has perhaps 10% variation built in, so someone who runs a 4.24 instead of being 99 speed is somewhere between 91-99 speed. This makes it more difficult to rely exactly on the Combine. There are more players in the pool, giving you more people to scout (and therefore, a lower overall percentage of players can be scouted). The number of "stud" players is much less. In an average draft, I'm seeing about 33 players who are above 78 overall, with only 12 of those having "superstar" or "quick" development traits. Only about 11 players in an average draft are 80+ overall. So it's much tougher to get a great draft. But never fear...I do believe I've cracked the code again. And to be honest I think that the changes make it more realistic, more challenging and more fun. So I'm fully behind it. Start with the coach type who has the Expert Scouting Package. You're going to need all the points you can get. Scout every week. Otherwise you lose half that week's points--they don't all carry forward. Only scout players you actually want to know more about. If you are stacked at HB, don't waste points on HBs. Never spend points on FB, K, or P.
Use your WATCH LIST to capture players who "pass" all the Scouting trials below. That way on Draft Day you can simply sort by "Watch List" and you have all your players. For the specifics, you can download the entire guide here, or you can just bookmark this page (photos embedded below). 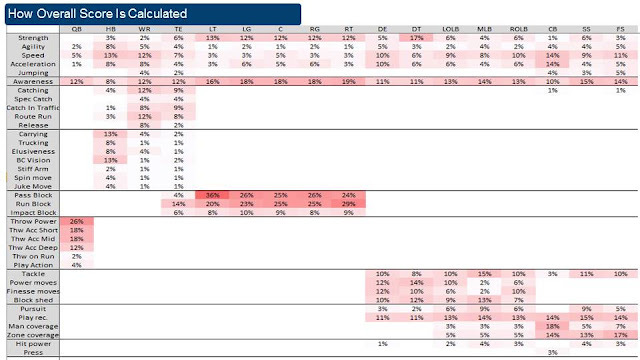 For best results, follow the below order exactly, only deviating to "skip" positions of strength. If someone fails to meet the criteria of the first bullet point, DO NOT WASTE ANY MORE POINTS. Move on to the next person. 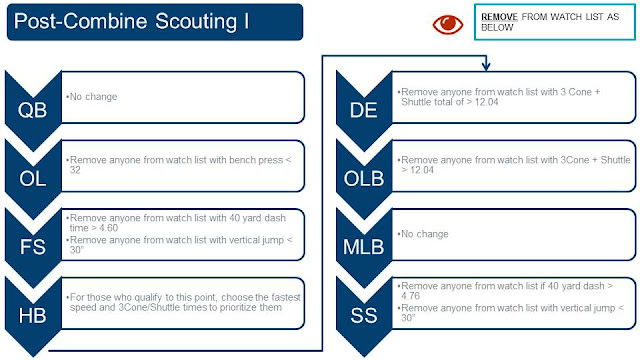 The first thing we do after getting scouting combine results is to REMOVE people from our watch list. 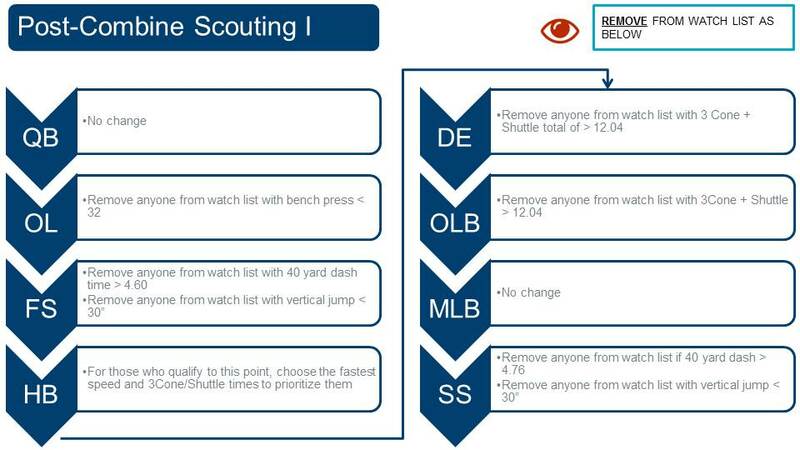 Some of those above qualify until we see their measurable combine ratings, and now should be removed. You don't have to remove anyone here, but look at the 40 yard dash 3Cone, and Shuttle times. Anyone who is very fast at all of these, and made it to your Watch List in step 4, is going to be very good. (3Cone + Shuttle are the predictors for Agility and Acceleration). Add together 3Cone + Shuttle times. If it is over 12.04, remove the player from your watch list; if below, they will have good enough Agility and Acceleration. Remove anyone with 3Cone + Shuttle score over 12.04. You want them to be agile. Remove anyone with vertical jump < 30"
As a final step (if you have any points left!) we will look at those who we have not yet scouted. So on draft day, if you have two players in the same round or at the same position and can't decide, what do you do? Comment. Tell me that you like it. Post elsewhere about it. Reddit forums, Madden forums...let others know!